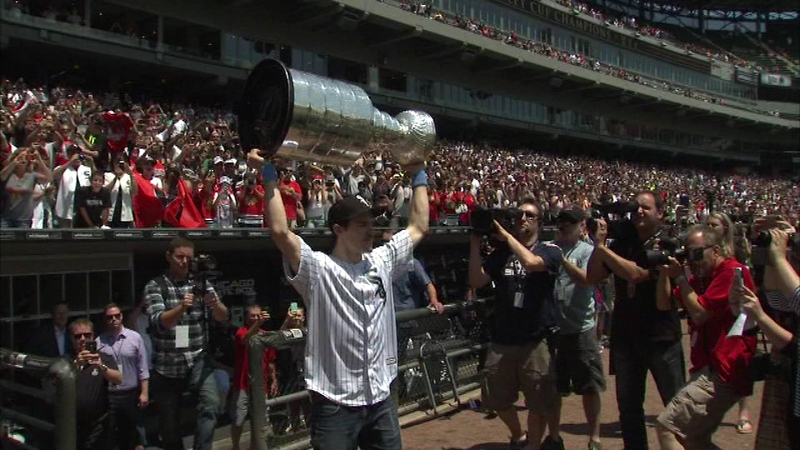 Blackhawks center Andrew Shaw displays the Stanely Cup at U.S. Cellular Field before the White Sox game on Sunday. CHICAGO (WLS) -- The Chicago Blackhawks championship celebration continued on the South Side when the Stanley Cup made a stop at U.S. Cellular Field before Sunday's White Sox game. Andrew Shaw had the honor of bringing the cup onto the field in front of cheering fans. He was joined by Coach Joel Quenneville and Michal Roszival, who is still on crutches after fracturing his ankle. The White Sox then came out to take a picture on the field with the Cup. Stanley Cup etiquette: To hoist? Or not to hoist?